Regal ESL H-13 Nitrided Ejector Sleeves, machined from H-13 hotwork die steel, are nitrided on ID and OD surfaces to Rc 65-74 for optimal wear resistance. Offered in 109 standard sizes with IDs from 3/32-Â¾ in. and lengths from 3-12 in. in 1 in. increments, sleeves can also be produced as specials down to 1/16 in. ID, with varying wall thick-nesses, ID/OD combinations, and lengths to 25 in. Custom front and EDM forms, head flats, vents, and other steels can be provided. A new line of ejector sleeves that are machined from H-13 hotwork die steel and nitrided on the inside and outside surfaces for optimum wear resistance are being introduced by Regal Components, Inc. of Clearwater, Florida. Regal ESL H-13 Nitrided Ejector Sleeves are machined from H-13 hotwork die steel and nitrided on the I.D. and O.D. to Rc 65-74. Designed to withstand heat and provide optimum wear resistance, they are offered in 109 standard sizes from 3/32" to 3/4" I.D. and 3" to 12" long in 1" increments. In addition to the standard line, Regal ESL H-13 Nitrided Ejector Sleeves can be produced as specials down to 1/16" I.D., with varying wall thick-nesses, I.D. and O.D. combinations, and lengths to 25". Custom front and EDM forms, head flats, and vents can be provided, as well as other steels. Regal ESL H-13 Nitrided Ejector Sleeves are priced from $22.05 ea., depend-ing upon size and quantity. Literature and pricing are available online. 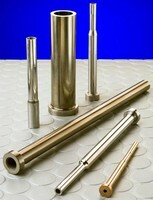 Ejector Sleeves are custom machined and finished.